The Hyde Park Presbyterian Church began as an outpost Sunday school chapel in 1910 at a building on the corner of Oregon and Inman Avenues. In 1917, the success of the outpost enabled the congregation to begin construction on a new masonry church building, this served the community until the early 1950s. The present-day brick Neoclassical sanctuary was completed and dedicated in 1953. 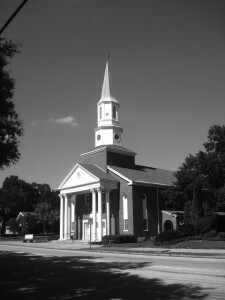 The Neoclassical style church is dominated by a symmetrical facade with a full-height porch supported by classical columns.